We have a bonus room over our garage where I keep all the seasonal decor, craft stuff, and lots of other important junk. It's my own personal hoarder space. And since I have been confined to downstairs, I haven't seen it since July 13th. I really miss it. Two more weeks until I can walk without worrying about all this weight-bearing stuff. Not only will I be able to get to all the treasures in that room, I'll also drive to Hobby Lobby or HomeGoods whenever I want to. Mind you, Amazon and many other online stores have benefited from my situation. A couple of days ago, I talked my son into getting the "tub of pumpkins" down for me. Bless his heart (and mine). I guess I didn't explain that I wanted the one with the general fall pumpkins. There is also one with the strictly Halloween stuff that I just put out at the very end of October for the benefit of the trick-or-treaters (think dancing Frankenstein that plays The Monster Mash). Yup, of course, that was the one he carried down. My son does not read blogs or check Pinterest. The Instagram photos that he looks at do not show how everyone is getting ready for fall. He hadn't understood why I needed pumpkins at the beginning of September in the first place. The idea that there were two different Rubbermaid tubs of pumpkins in the storage room completely blew his mind. It took two days for me to get him to go back up and find the other one. (Did I mention that there is a lot of stuff up there?) The good news is that this afternoon he did. So now I'm happy. There is a pumpkin displayed in our home. One lone metallic pumpkin. It's a start. I also took my first partial weigh-bearing steps (with crutches) on my post-surgery ankle today! That's a start, too. Please come back Sunday night to link up to our new Monday Social Party. Judith from Botanic Bleu has written two great blog posts on how to link up from Pinterest and Instagram. 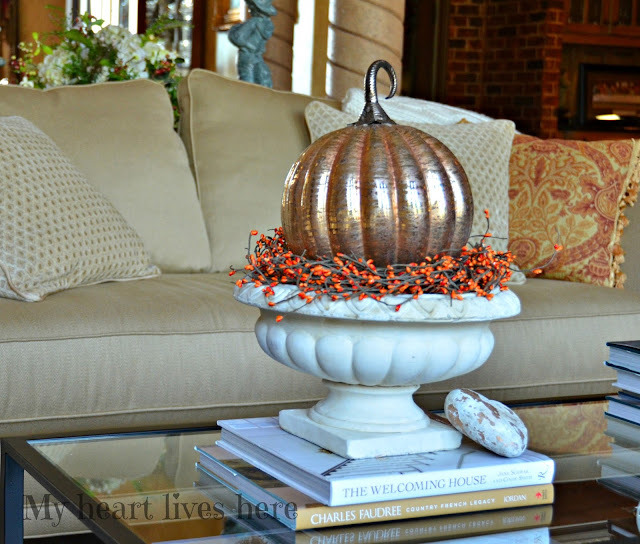 It is a lovely pumpkin and a good start for fall decorating. I hope you feel better soon. This is too funny! Well, at least he made the effort to go back up and search again. Your pumpkin is lovely! 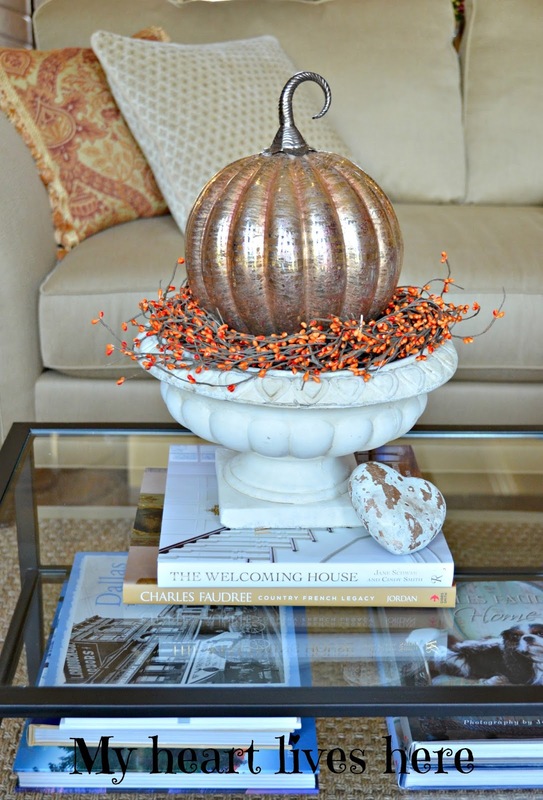 I'm loving all of the metallic pumpkins this season. Glad to hear that you are healing nicely! Your post made me laugh tonight! I'm so happy to hear that you will soon be able to go to Hobby Lobby and HomeGoods whenever you want! I know for us girls, it's so hard when we can't do the things we normally do, especially shop! Your Fall vignette looks beautiful. I love the metallic pumpkin. I hope that you have a wonderful weekend!!! Oh, Eilis, I SO understand your frustration! I broke my ankle six weeks ago and am finally in a boot, but still can't drive. Two days ago a friend took me shopping for fall wreaths and I was in Heaven! Enjoy your lone pumpkin...it is a sign of more to come! We are in the same boat! Hope your healing goes really well.